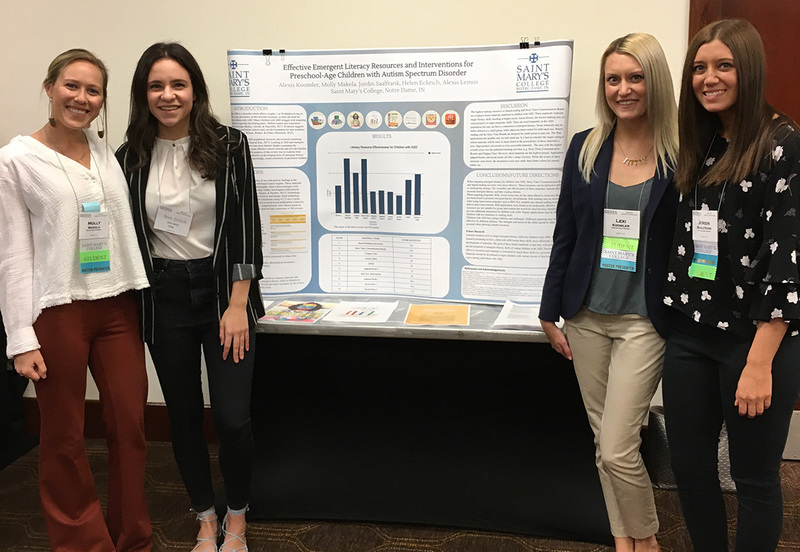 This year as part of the Research Methods course, Master of Science in Speech Language Pathology students culminated their research projects with poster presentations. 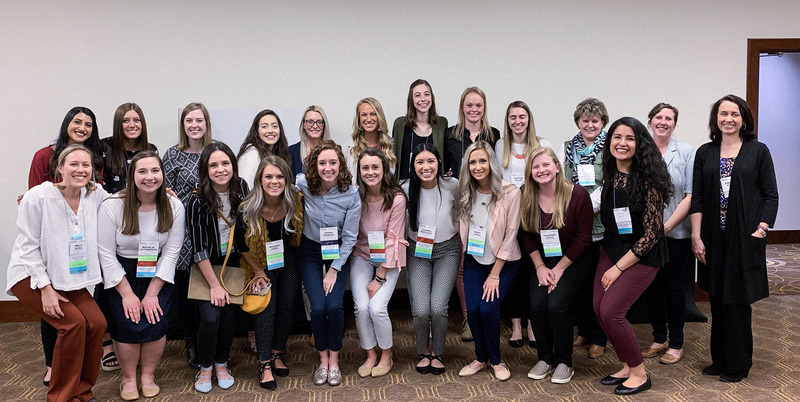 Many of the students presented their findings at the Indiana Speech-Language-Hearing Association (ISHA) Convention 2019. 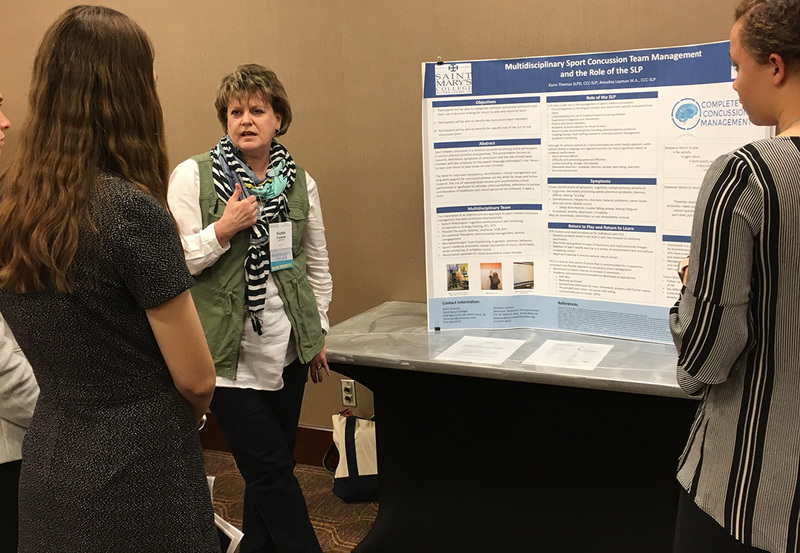 Poster projects and presentations are a great way to collaborate as well as share knowledge with current practitioners. 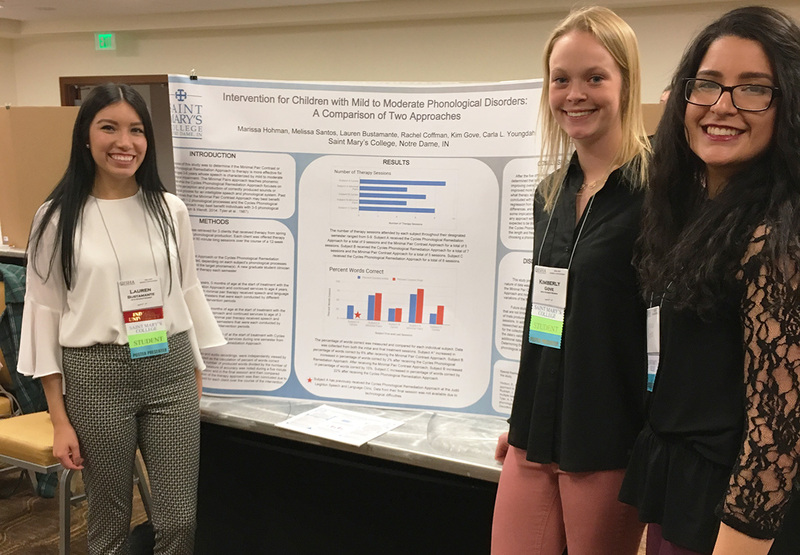 Graduate and undergraduate student teams conducted research on emerging topics in speech-language pathology. Learner Objectives: 1. Identify common treatment approaches for phonological processes; 2. Identify effective ways to monitor progress toward phonological process reduction; 3. Identify factors that influence treatment approach effectiveness. Course Overview: Evaluations of the effectiveness of maintaining or changing an intervention approach with a child between the ages of 4- and 6-years old who presents with a mild to severe speech sound disorder from one semester to another were studied. 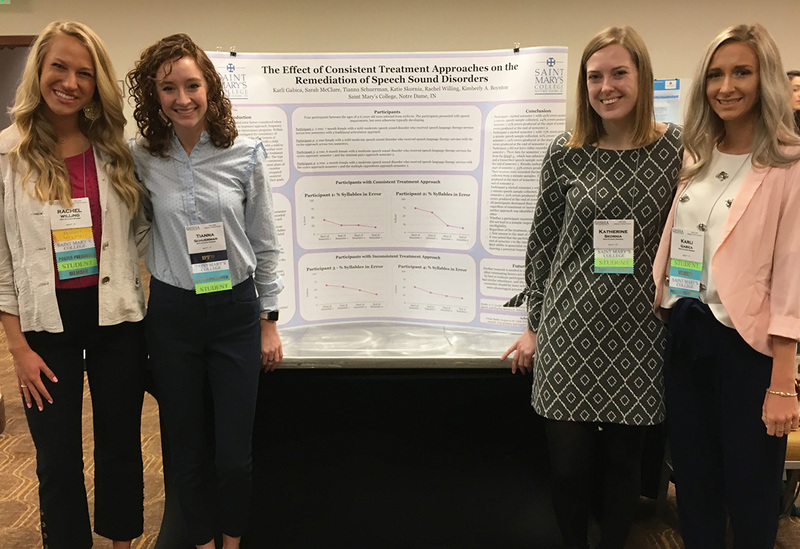 Previous therapy treatment plans of four clients at the Judd Leighton Speech and Language Clinic were analyzed to monitor changes in speech goals or progress toward goals. Anticipated findings are that the students who received a consistent treatment approach will have greater progress toward their goals. Factors are being analyzed to draw conclusions for this study. Learner Objectives: 1. Identify the language deficit areas of young children with autism spectrum disorder; 2. Define the differences in early literacy skill development between typically developing children and children with autism spectrum disorder; 3. Identify appropriate tools to promote emergent literacy in therapy with young children with autism spectrum disorder. Course Overview: Emergent literacy skills are prerequisite skills that determine future success in reading and writing. Students with autism spectrum disorder (ASD) often have difficulty developing these skills compared to typically developing peers. Many resources have been developed to increase the effectiveness of delivering instruction for emergent literacy skills. This study will determine which available emergent literacy resources and interventions provide the best learning outcome for preschool students (ages 2-6) with ASD. A rubric will analyze literacy materials based on functionality, content, and accessibility. Information gathered will be used to address the need for additional literacy materials for children with ASD. Learner Objectives: 1. Gain knowledge about the easy-onset technique; 2. Gain knowledge about the light contact technique, 3. Acquire knowledge of treatment options for reducing repetitions and blocks. Course Overview: There is limited research and knowledge about stuttering in adults. The purpose of this study is to examine whether the easy onset technique or the light contact technique for stuttering yields more fluent utterances, specifically a reduction in repetitions and blocks in a fifty-five-year-old male with a severe stutter who has never previously received speech therapy. Data from individual speech therapy sessions was analyzed to determine efficacy. Results established greater efficacy for a reduction in repetitions and blocks when the easy onset technique was utilized for this particular client. Learner Objectives: 1. Identify appropriate treatment interventions for phonological impairments in the pediatric population; 2. Identify the benefits of the Minimal Pair Contrast and the Cycles Phonological Remediation Approach. ; 3. Identify appropriate measures to determine the efficacy of different approaches. Course Overview: This study was conducted to determine if the Minimal Pair Contrast or Cycles Phonological Remediation Approach to therapy is more effective for children aged 3-6 characterized by mild to moderate phonological impairment. Treatment lasted 12 weeks. The effectiveness of the treatment approach was based on percentages of consonants correct gathered weekly. 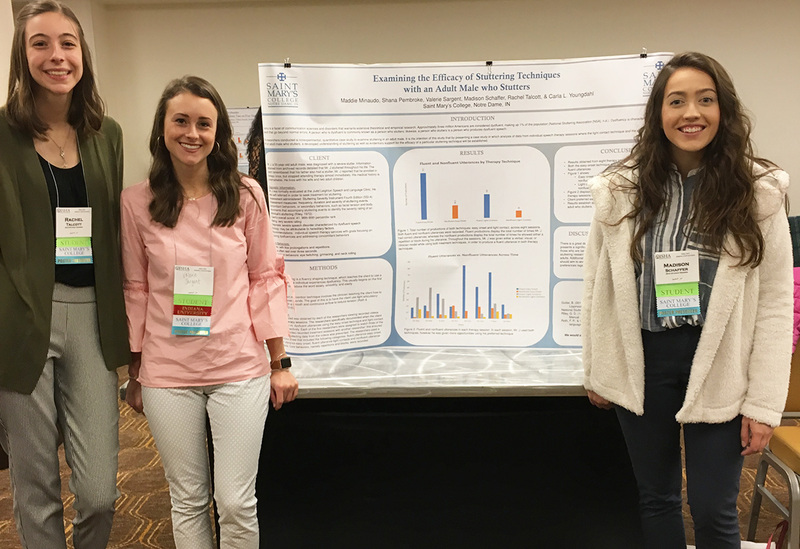 Three children aged 3-6 from the Judd Leighton Speech and Language Clinic participated in the study based on the intervention approaches implemented. It is anticipated that the Cycles Phonological Remediation Approach will be more effective in treating phonological disorders. Learner Objectives: 1. Identify common symptoms of Broca's aphasia and its impact on communication; 2. Identify social communication and social interactions between the individual with Broca's aphasia and their communication partner; 3. Identify and examine the efficacy and efficiency of current partner communication training resources. Course Overview: At-home therapy has proven to be an effective method to increase generalization in person(s) with aphasia (PWA). Caregivers lack resources throughout all stages of aphasia; training will allow the caregiver to become a resource for the PWA and increase communication. 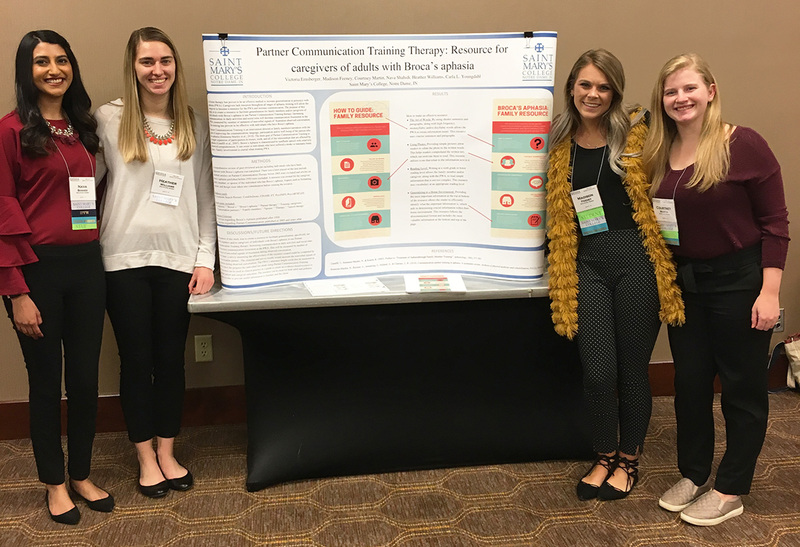 The purpose of this study is to create a resource to facilitate generalization for family members and/or caregivers of individuals with Broca's aphasia to use Partner Communication Training therapy. Increasing communication in daily activities and social roles will decrease communication frustration in the PWA, measured by number of instances of nonverbal signals of frustration during observed conversation. Learner Objectives: 1. Identify which morphemes are often difficult for children with language impairments; 2. Identify the benefits of using children's books in language therapy, 3. Identify specific books that can be utilized to target morpheme development. Course Overview: This project's aim is to create a resource list of children's books that can be used to target early morpheme development in children with language impairments. Speech-language pathologists use books but may not have the time or resources to investigate the best morpheme use in books. This project analyzes the typical preschool curriculum to compile a list. Integrating our reference list promotes a positive relationship between reading and learning that will help in the later stages of language and literacy development. The analysis includes the average sentences per page, average words per sentence, and the frequency of target morpheme occurrence. Learner Objectives: 1. Identify social communication and social interaction criteria of the DSM-V for the diagnosis of autism; 2. Identify restricted, repetitive patterns of behavior, interests, or activities that are included as criteria in the DSM-V for the diagnosis of autism; 3. Identify the disproportional/inaccurate portrayals of autism in current popular culture TV shows and movies. 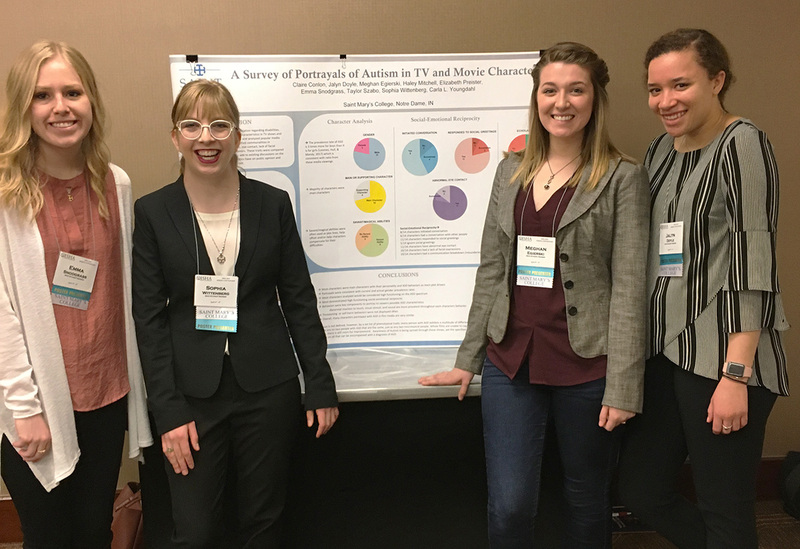 Course Overview: Alongside a growth in public awareness and education regarding disabilities, portrayals of Autism Spectrum Disorder (ASD) characteristics in TV shows and movies have increased. This research identified and analyzed popular media featuring characters with ASD traits, and identified commonalities in measurable traits including, but not limited to, eye contact, lack of facial expression, and repetitive routines and behaviors. These traits were compared to DSM-V diagnostic criteria for ASD. 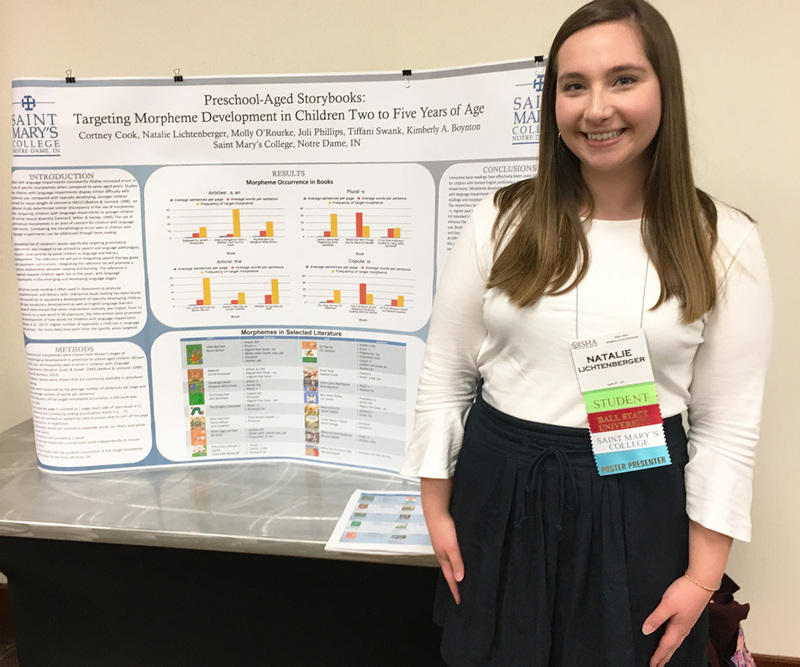 Results add to existing discussions on the impact fictional portrayals of ASD characteristics have on public opinion and knowledge about ASD, whether accurate or not. Learner Objectives: 1. Participants will be able to categorize common concussive symptoms and their use in decision making for return to play and return to learn; 2. Participants will be able to identify key concussion team members; 3. Participants will be able to identify the specific role of the SLP on the concussion team. Course Overview: Sport-related concussion is a common occurrence among active participants in various physical activities and pastimes. This presentation focuses on research, definitions, and symptoms of concussion and the role of each team member with key emphasis on the speech language pathologist’s role. Return to learn and return to play issues are also included. The need for improved consistency, identification, clinical management and long-term support for concussed athletes are key areas for study and further research. The risk of repeated brain trauma and unsatisfactory school performance is significant for athletes unless guidelines, adherence to policies and education of healthcare and school personnel are followed. It takes a team.